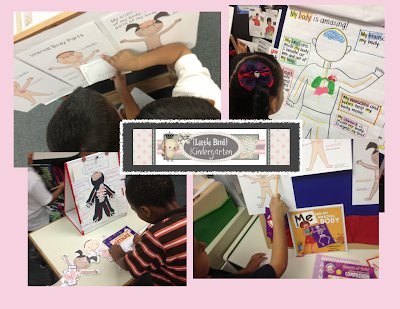 We are having so much fun learning about the body. I always find it so interesting how much they don't know and how interested they are in everything we talk about. They really are little sponges! After talking about the digestive system today, they came back from lunch talking about how they could feel the cold milk going down their "food pipe". Too cute! I have been getting things ready for our Craftivity/Research project to do at the end of this week, I can't wait to see how excited they will be! I have put together a resource to help teach little learners about the body. 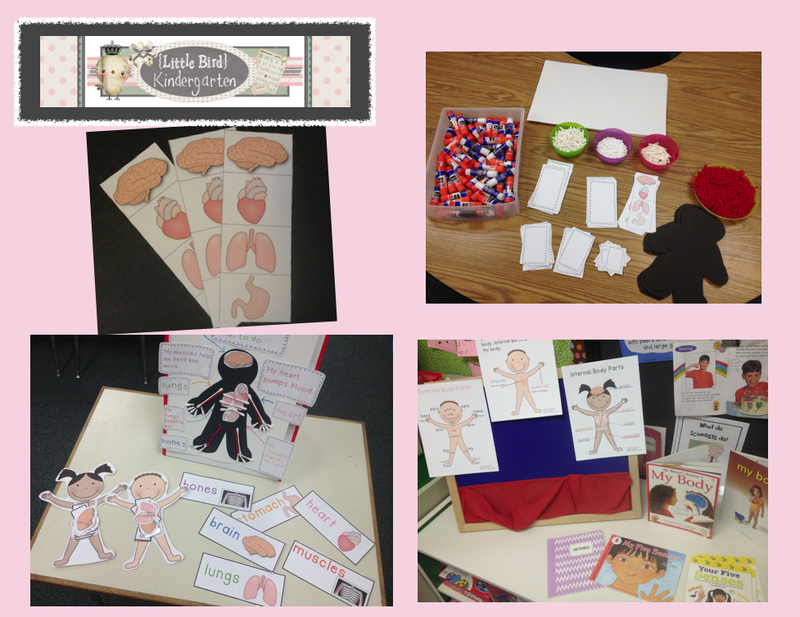 Lots of anchor charts (very child friendly) and lots of other goodies! (Writing prompts, vocabulary cards, Felt Figure Oral Language Center, Write Around the Room, and the fun Craftivity/Research Project). 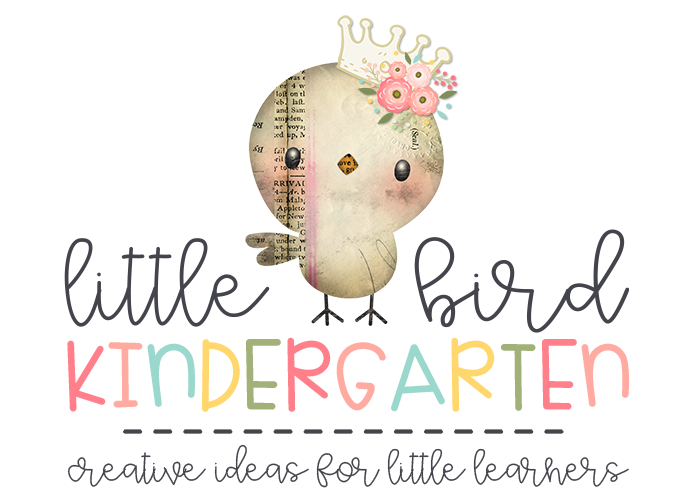 I will update this post after the little researchers get their projects done! "writing stations" around the room with anchor charts, vocabulary cards, and books about the body. I set up all of the materials on the table and we talked about what they could use to do their project. The only thing I requested was that they write at least four or five journaling cards before they start. owned it. The range of finished projects was definitely wide as far as ability, but each was very proud and loved what they had produced. I tried to get around to as many as I could to elicit some conversation "Tell me about this organ?" They really soaked up the facts, great language and vocabulary being used, and pretty good sentences (we are working hard on using complete sentences). My favorite was "This is the stomach, it makes my food digested-ed". One of my take aways for doing this next year is to have many more copies of the vocabulary words, this was just a really accessible way for many of them to connect the text to the content. 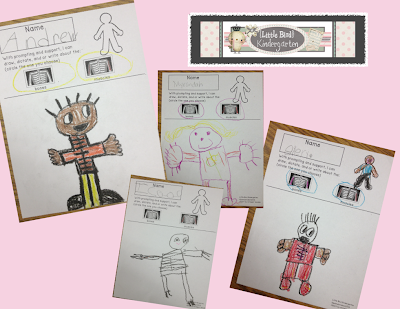 Next week we will share our projects with a "museum walk", and then I will hang them in the hallway. I'll update then, until then, thanks for checking in! 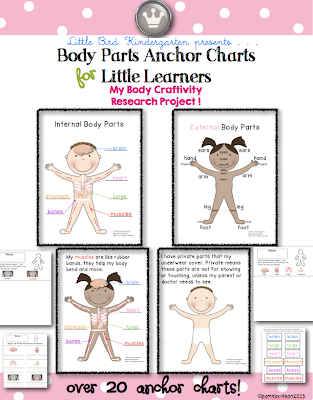 I have now completed The Body Close Reading and Listening for Little Learners! 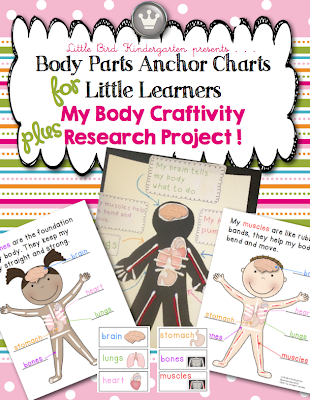 It is available on its own and also as a Bundle together with the Anchor Charts resource! It is the perfect companion! 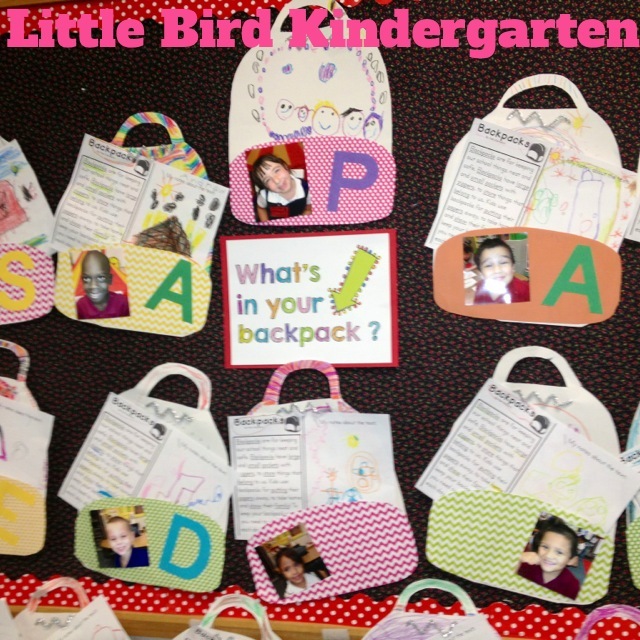 We had so much fun doing our Close Reading about "Backpacks" that we took it one step further with a little art project. Simple construction paper cut into the shape of a backpack with a scrapbook paper pocket at the bottom. Boy did they have the ideas for designing their backpacks! The "zippers" at the top are made from silver pipe cleaners bent into a zig-zag, then poked in the top. Inside the pocket.... their annotations from the Close Reading activity of course! 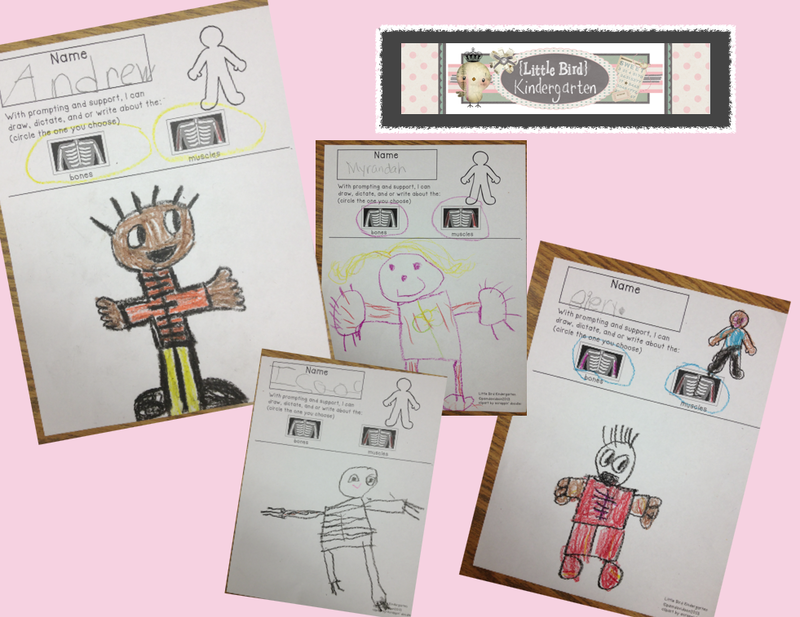 Close Reading for Kindergarten & First Grade: Getting Started! Fee Fi Fo Fum! 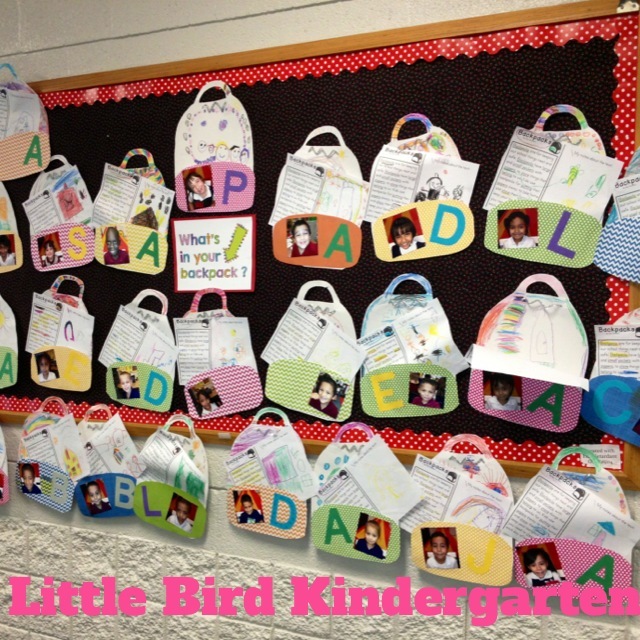 Kinders cannot live on chicks alone! Non Standard Measurement with Beanstalks! Chicken Life Cycle: The Oral Retell.... they are getting good!